Manage the users of System Frontier on the Users page under Settings. The main function of the Users page is to enable you to add new users and modify existing users. You can also view users and filter or sort those displayed results according to the number of items configured to show on the page. System Frontier uses Active Directory, so when you add or modify users, you will be working with those credentials. Administering users on the Users page has no effect on that account in Active Directory. 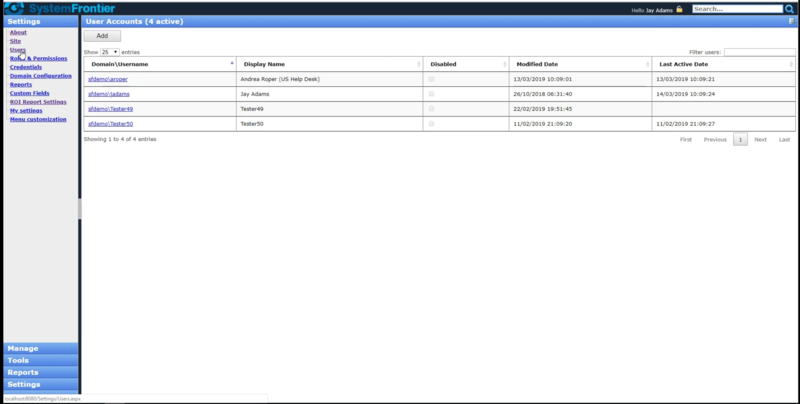 The purpose is to add users so that they can have permissions to work within System Frontier. 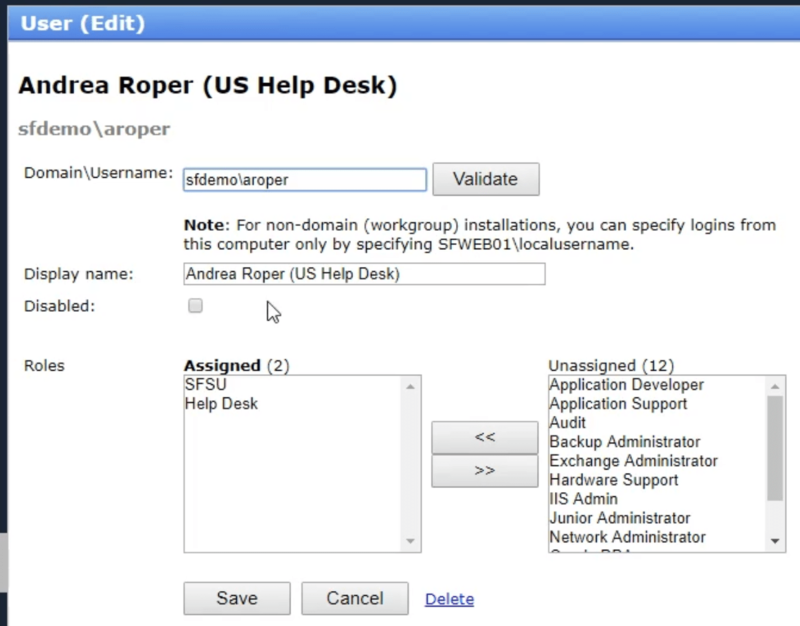 For non-domain (workgroup) installations, you can only specify local accounts existing on the computer that is serving the web page for System Frontier. Adding a new user into System Frontier is easy. Click on the Add button to see the User (Insert) page. Just type in the domain\username and click Add. System Frontier will query the domain and, if the name is valid, add it. A disable checkbox is there in case you’d like to disable the account in System Frontier upon adding it. Disable the user. Disabling a user here has an immediate effect without delay since System Frontier is role-based and the disable occurs entirely within the System Frontier framework. Assign roles. Selecting multiple roles at one time is possible. Delete the user. This only deletes the user within the context of System Frontier access. Clicking the Save button enacts the changes. Click on the Domain\Username of the account that you wish to delete. On the User (Edit) page click the Delete link next to the Cancel button. Deleting a user in System Frontier has no effect on that user’s Active Directory account. Be sure to read the User Guide for more information. System Frontier gives organizations an easier solution for reducing administrator rights to manage Windows servers and workstations. Copyright © 2010-2019 Noxigen LLC. All rights reserved. "System Frontier" is a trademark of Noxigen LLC.